The World Muay Thai Organization is proudly hosting the pro-am and professional Muay Thai championships at the 4th International & Thai Martial Arts Games and Festival in Bangkok – March 2019. The spectacular event held by The Kru Muay Thai Association (KMA) is kicking off from the 8th March 2019. Supported by the Tourism Authority of Thailand (TAT) and the Ministry of Culture and Foreign Affairs. Our aim is to preserve Thailands National Heritage as well as promote peace and friendship through sport. 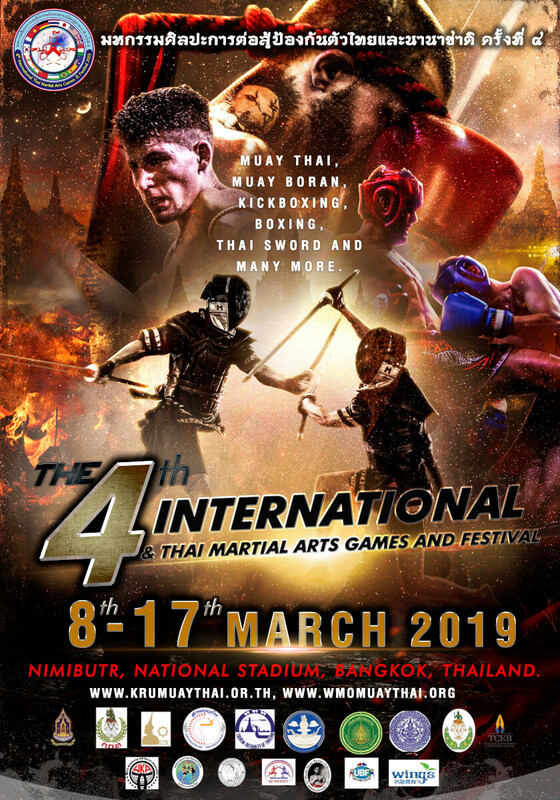 The event will start off with competitions focusing on Thai martial arts; such as Thai Sword or “Dap Thai”, “Mae Mai Muay Thai” (Ancient muay thai choreographed technical styling) and “Keta Muay Thai” (Muay Thai aerobics). As part of the Festival, the KMA will hold seminars in Muay Thai Boran instructed by our most honored teachers. 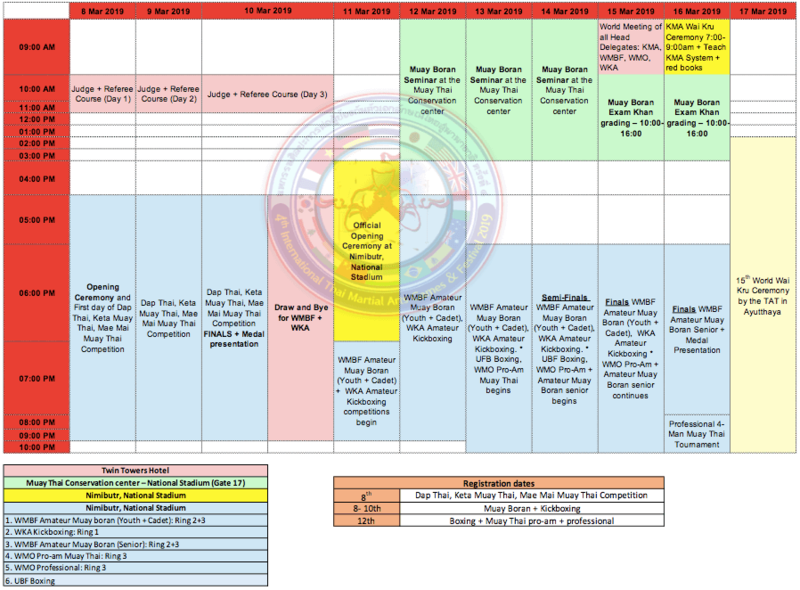 As well as, courses in judge and refereeing for muay thai and muay boran, where participants will take an instructional course followed by real practice during the second half of the event which starts on the 11th March after the official opening ceremony. 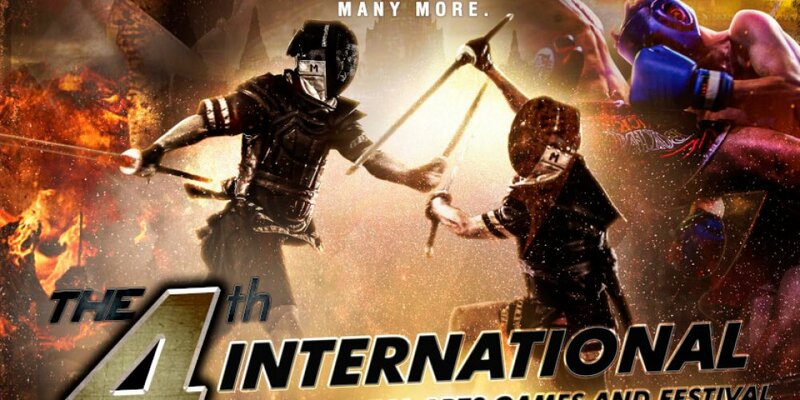 The second half of the International & Thai Martial Arts Games will host International competitions in Muay Boran (Amateur), Kickboxing (Amateur), Boxing (Amateur) and Muay Thai (Pro-am and Professional). round and compete in their home countries in order to prepare for this huge marquee event. The festival is a “Once in a lifetime” opportunity for many of our enthusiastic athletes and it is the Kru Muay Thai Associations honor to bring this event to the people. The KMA has organized annual World Championships for over a decade and believe that is it the best way to promote Thailands National heritage as well as enhance pride and friendship amongst the community. The Kru Muay Thai Association would like to thank our Partner organizations as the hosts in their Martial Arts categories: World Muay Thai Organization (WMO), World Muay Boran Federation (WMBF), World Kickboxing Association (WKA), Dap Thai Society and Union Boxing Federation (UBF). As well as our supporters such as Wings (WMO China) for their contributions to the festival. I am interested in competing in Kickboxing. Can you please forward me the information pack, thanks.